On the basis of TOR technologies, the TORtec GROUP has developed advanced methods and techniques of disintegration of biomass by degradation of the polysaccharide skeleton of plant cells, cellulose and lignin with the extraction of biologically active substances (BAS) and valuable components into the native the biologically active substance. The «cold» way of activation and mechano-chemical synthesis with the opening of the phyto cells and the extraction of BAS in the resonant gas-dynamic working chamber of the «TORNADO» unit favorably distinguishes TOR-technologies from all existing methods — mechanical, chemical, hydrolysis and other multi-stage processes — the disintegration of phyto mass occurs without an increase in temperature, sometimes even with a decrease, the least damage is done to intracellular polymers, that is, the native (natural) states of BAS are preserved as much as possible and their natures are multiplied Single (natural), synergist. In addition, the technologies were designed in such a way as to avoid waste and by-products. Thus, after the extraction of BAS and / or oils, the remaining biomass has almost 100% digestibility and the body does not need to spend energy on digestion, and dietary fiber becomes a valuable and easily digestible product of functional food or feed, and also a food additive. Since the process of grinding biomass occurs in the process stream to a level below 1 micron, incidental disinfection of the mass takes place from pathogenic bacteria, the size of which is always above 1 micron. TOR-biotechnologies have opened up new opportunities for one-stage processing of incoming biosaw materials in mixtures and proportions, previously modeled by technologists with the aim of obtaining multifunctional biomedical mixtures for pharmacology, cosmetology and functional nutrition. For three years the team of scientists and engineers of the TORtec Group has developed technologies for deep and waste-free ecologically clean processing of more than 230 types of medicinal herbs, cereals, agricultural wastes, food, woodworking and pulp industries, poultry and livestock waste. 11 industrial lines of the «TORNADO» in the direction of BIO + and 4 bio-factories were designed. The customers have highly appreciated the achievements in this area of the group’s activities, ordering bio-factories for the production of pectin, the production of BAS from medicinal plants, the production of biological plant protection products, the production of a new class of sorbents and biofertilizers, the deep processing of green cannabis, rice production waste. Due to the great prospects of commercialization and application of TOR-biotechnologies, TORtec Group has established СШАits branches and companies in Switzerland, Bulgaria, Kazakhstan, the USA and research bio stations in the Republic of Cyprus and Macedonia. In the BIO + section some examples of applied applications of complex TOR-biotechnologies and Tornado installations are given. It is estimated that the world biotechnology market will reach $ 2 trillion in 2025, the growth rates for individual market segments range from 5 to 30 percent annually. Consumers of biotechnology products are mainly highly developed countries: USA, Canada, Japan and Europe. However, during the current decade, the developing countries have also joined the technological race: China, India and Brazil are implementing large-scale development programs across the entire range of biotechnologies. The importance of biotechnology for economic development is difficult to overestimate. The modernization of technological base of modern industrial production is impossible without mass introduction of biotechnologies and biotechnological products. Moreover, for a number of industries (agro-food sector, forestry sector, a number of sub-sectors of the chemical and petrochemical industry, the pharmaceutical industry and the biomedical health sector), modernization will mean a shift to biotechnological methods and products. The tendency to replace chemical products with biological products was formed 30-40 years ago. In the past 20 years, fundamentally new biotechnologies and products have been created in the world, and the production of previously known ones has been substantially optimized. The total volume of the biopharmaceutical market by 2016 is estimated at $ 300 billion. The world market of food ingredients is currently estimated at 36 billion US dollars, in 2017 the market will grow to 48 billion US dollars. The world market of therapeutic nutrition is estimated at 20 billion US dollars. This segment is dynamically developing in the world, and by 2017 the sales volume can reach more than 29 billion US dollars. According to the leading world companies, already in the second decade of this century, it is possible to replace up to 30% of traditional bio products with innovative ones. Technologies of production of liquid and solid biofuels will be introduced; raw materials for the pharmaceutical industry; carbon fibers and carbon plastics from precipitated lignin; composite materials; polymers. A number of TOR-technologies allow us to take the leading positions in the field of biotechnology development in selected areas of biomedicine, agrobiotechnology, industrial biotechnology and bioenergy and the creation of a global competitive production of integrated and waste-free universal bio-factories with unification for specific phytomasses and diversification of production. The «BIO +» project, created in 8 countries, is a group of the global market, a high-tech market and a demanded market in relation to new products, where the fundamental role is played not by competition but by the effectiveness of the target group to produce «breakthrough» products that are intended and necessary for people in new technological and environmental conditions of the 21st century. Based on the developed TOR-biotechnologies, powders and solutions of all fruits, berries, vegetables, mushrooms, meat, fish, medicinal and agricultural herbs, beans, spices rich in vitamins, antioxidants, minerals that can not be synthesized in the body or lack must come with food. 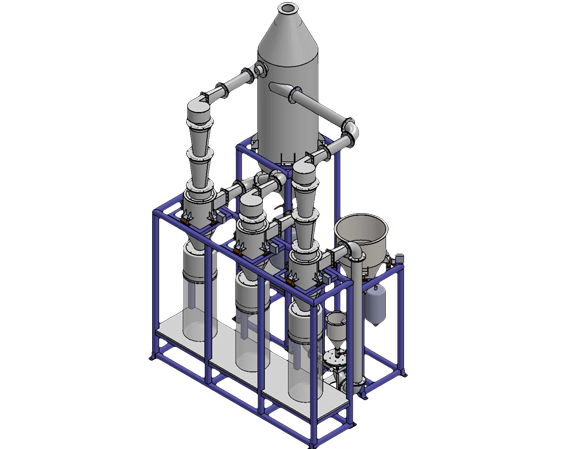 To obtain colloidal solutions with BAS and trace elements, the use of activated (structured) water on the Tornado plant is additionally applied. Such water is an active and safe solvent of valuable components from the structure of the disintegrated plant cell. The main advantage of TOR-biotechnology is that activation of the plant raw material and grinding it on the micro-nanoscale takes place with complete preservation of cell substances (with the exception of macromolecules of the cellulose skeleton and shell), a genetically complete cell of life that allows not only to preserve the bioenergetics of the feedstock, all vitamins, macro and trace elements, organic acids and other nutrients contained in the feedstock, but also tens of times to increase the total energy charge of the product. And this gives a double positive effect on the living organism. Activated and disintegrated food in the Tornado plant, such as bran, wheat or barley straw, can serve as additives to a variety of products produced by the industrial method, as well as for food compositions with a sorbent, a kind of matrix (basic filler) that can be enriched with proteins , amino acids, 6 biologically active substances (BAS), vitamins and microelements for the production of a wide range of nutraceuticals (food products that provide health), dietary supplements and other foods as well as feed for animals, fish and birds. Disintegrated in the «Tornado» installation fruits and vegetables preserve all vitamins and other nutrients. Biologically active food additives, along with specialized food products, are the most effective way of eliminating vitamin deficiencies, but with the condition that biological substances are kept in doses corresponding to the physiological needs of the person. Biologically active food additives in most cases belong to the class of natural components of food and have pronounced physiological and pharmacological influences on the basic regulatory and metabolic processes of the human body. Biologically active substances released from plants and some animal products on Tornado plants are the raw materials for pharmacology and the dietary supplements industry, for cosmetology and the food industry. The TOR technology applied to the feedstock usually includes a vortex drying module for raw materials, a module for grinding and decontamination, a «Tornado» disintegration module, a module for preparing and activating water. The accompanying equipment, concentrators, mixers, packaging and laboratories are standard (GMP) and are provided for in the feasibility study, based on the terms of reference.